You love Frostburg. From the small-town Main Street charm to the friendly customers and neighbors you interact with every day, Frostburg is a great place to live, do business, and play. At FrostburgFirst, we strive to promote our downtown and its businesses, create dynamic events, and highlight all that makes Frostburg so special. This year we’ve added new and exciting membership packages for community members – individuals and families – non-profit organizations, and businesses! Have a look at the Membership Packages below. You’ll see that we’ve included social media boosts and additional web and digital coverage to our mid– and high-level membership tiers, giving your business extra exposure in our ever-growing online community. 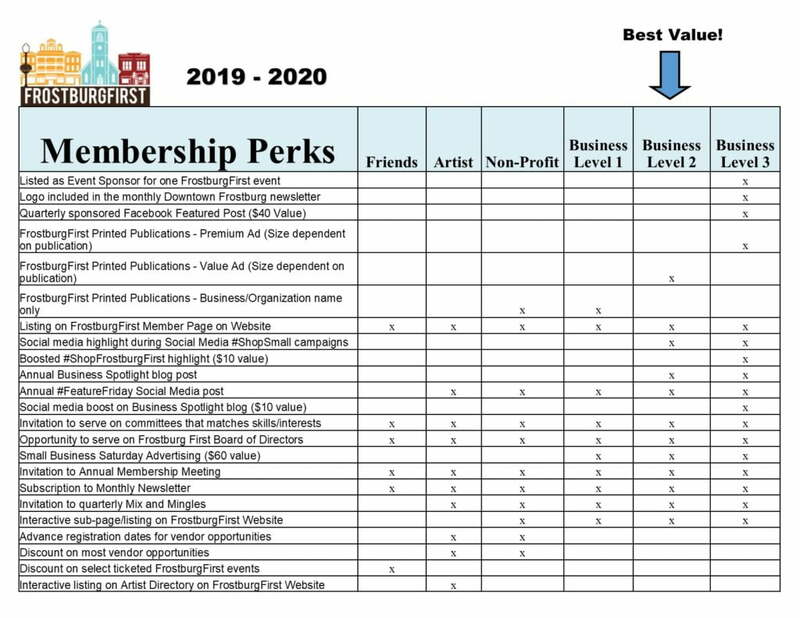 Your FrostburgFirst member perks allow you to reach more people while supporting our efforts of revitalizing our downtown business community. We are also opening up memberships to community members, increasing the network of support! Please take a look at fiscal Year 2019 to date, and what we plan for the fiscal year 2020! As always, your support of our mission to develop and foster a prosperous, vibrant, sustainable, and resilient designated Frostburg Main Street Community is deeply appreciated. Find a membership tier that’s right for you or your business and complete the form below. 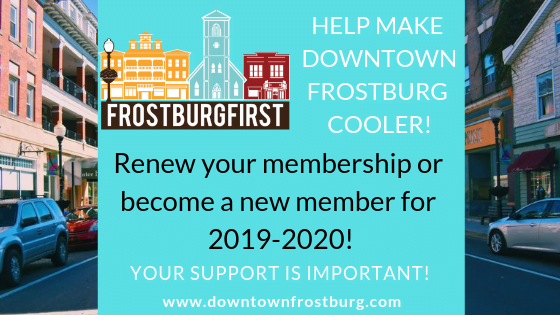 Your membership dues help us throw downtown events and marketing promotions that bring customers downtown, deliver marketing materials to information kiosks and visitor centers in the region, and promote Downtown Frostburg as a destination location to shop, dine, stay, and play. Or email forms to frostburgfirst@gmail.com! 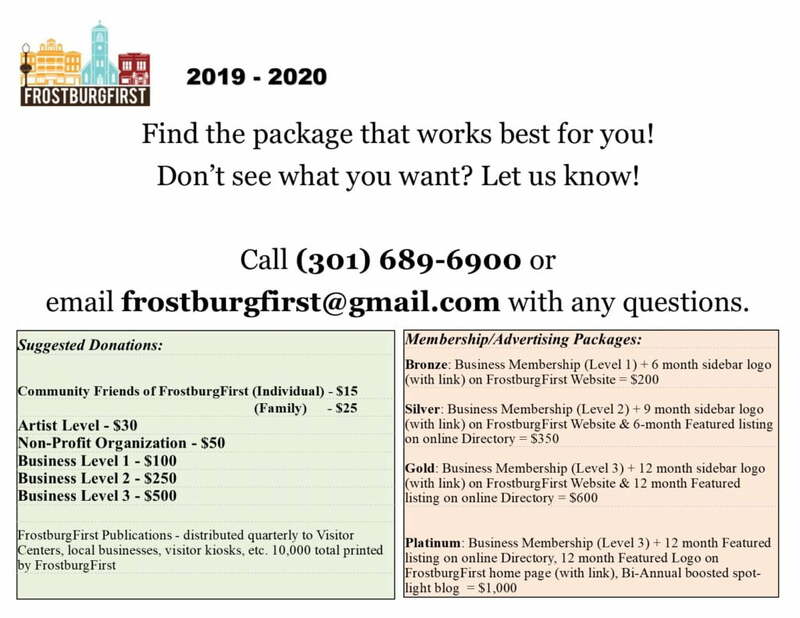 For more information about your FrostburgFirst membership perks, contact us at frostburgfirst@gmail.com.